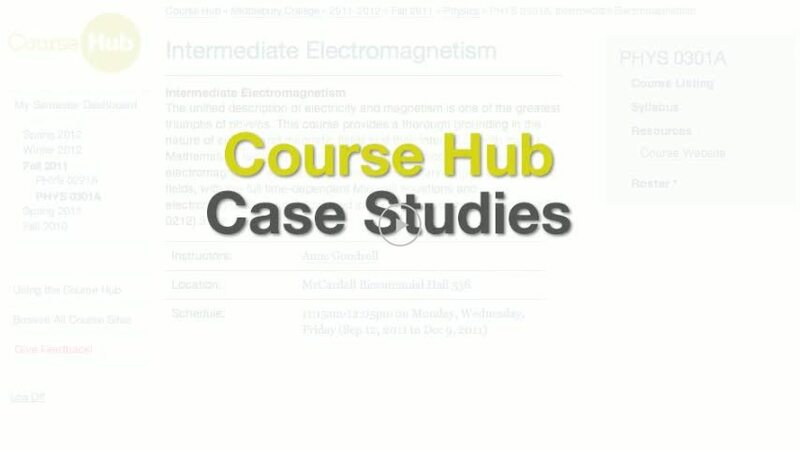 Below is a brief screen-cast describing how to create additional Course Hub sites. 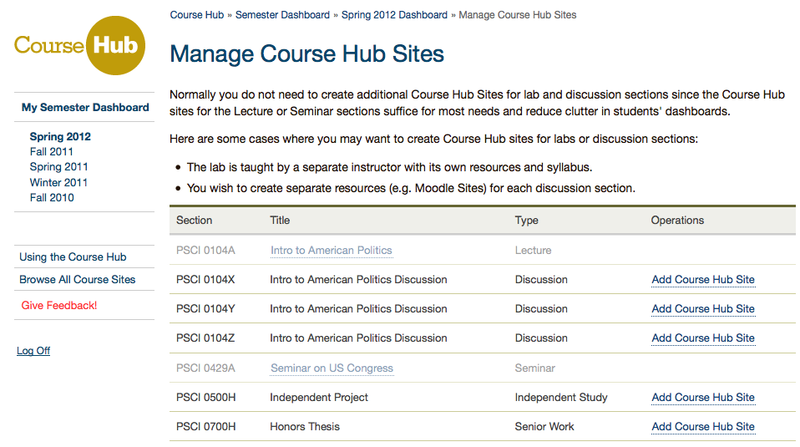 Go to your Course Hub dashboard. Click on the Manage Course Hub Sites link for a given term. You will see a list of all sections you are teaching in that term. Click the Add Course Hub Site link next to any section. This entry was posted in Midd Blogosphere and tagged Course Hub, Curricular Technologies, LIS Staff Interest, Middlebury Community Interest, Web Application Development on February 7, 2012 by Adam Franco. This entry was posted in Midd Blogosphere and tagged Case Studies, Course Hub, Curricular Technologies, LIS Staff Interest, Middlebury Community Interest, moodle, screencast, WordPress on December 1, 2011 by Alex Chapin. This entry was posted in Midd Blogosphere and tagged Curricular Technologies, LIS Staff Interest, Middlebury Community Interest, moodle, WordPress, workshops on December 1, 2011 by Alex Chapin. The Curricular Technology team has organized a number of workshops on the Course Hub, Moodle and WordPress which have been very well attended and have provided us with great feedback. This entry was posted in Midd Blogosphere and tagged Course Hub, Curricular Technologies, LIS Staff Interest, Middlebury Community Interest, moodle, WordPress on September 2, 2011 by Alex Chapin. This entry was posted in Midd Blogosphere and tagged Blackboard, Curricular Technologies, Curricular Technology, faculty, learning magagement systems, Library Spotlight, moodle, Sakai, Testing, ★ The Essentials on November 24, 2010 by Alex Chapin. This entry was posted in Midd Blogosphere and tagged Collection Management, Curricular Technologies, Liaisons, lis staff, Training on November 15, 2010 by Carrie Macfarlane.